Baoding is a famous historical and cultural city, 140 kilometers to Beijing in he south and 160 kilometers ,, Tianjin in the west. Its purist attractions include the \ncient Lotus Pond, one of the 10 famous ancient gardens in China, the well-reserved Governor's Residence of the Qing I h-nasty, the Western Tombs of the Qing Dynasty. nasty. the jade clothes sewn w with gold thread excavated from the Han tombs in Mancheng which arose the world-wide attention. and Jisiding-the Baiyangdian Hot Spring City where tourists may have a good rest, spend a holiday, hold meetings, build up their health, and do sightseeing. Baoding is a famous health city, known for its traditions of respecting and loving the aged, and the way to keep in good health. The average litespan of the Banding people is 6.4 years longer than nation's average. Here tourists may get .some idea of the martial arts, Qigong, Taijiquan, kicking the shuttlecock, playing iron halls, medicinal drinks and food, and the old people's rich and varied lives. Every year the large-scale Banding Health Festival for Honoring the Aged is held here. Zhuozhou, 62 kilometers to the south of Beijing, is the place of origin of the Three-kingdom culture, and Liu Bei, Zhang Fei and Guan Yu became sworn brothers here. Its historical sites include the hometown of Liu Bei and Zhang Fei, Zhang Fei Td hang Fei Well, the peach garden where Liu Bel, Zhang Fei and Guan Yu became sworn brothers, in addition to the Zhuozhou Film and TV City, the largest film and T\' base in Asia. 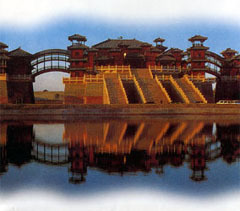 and the Jingdu and Jingnan golf courses. Every year Baoding holds the Lantern Culture Festival and the Mid-Autumn Moon-Watching Festival.